There are also structural reasons for certain required habits of mind and character in liberal democratic republics. In, “The Idea of Public Reason Revisited,” Harvard’s John Rawls drew an important distinction between a person’s public reason (about the public good) and a person’s private comprehensive reason (e.g. his religion). The first recognizes diversity and a public understanding of things. The second, at a different level, recognizes that people have different creeds and perspectives that give comprehensive meaning to their lives. The first belongs to Caesar, and the second belongs to God. Rawls further notes, “Citizens’ mutual knowledge of one another’s religious and nonreligious doctrines expressed in the wide view of public political culture recognizes that the roots of democratic citizens’ allegiance to their political conceptions lie in their respective comprehensive doctrines, both religious and nonreligious. In this way citizens’ allegiance to the democratic ideal of public reason is strengthened for the right reasons.” 4 However Berkowitz notes, “Liberalism has good reasons to diminish the significance to politics of virtue but betrays a tendency to take this economizing to an extreme by denying or forgetting virtue.” 5 This is a consequence of having a public reason that spans the creeds of a diverse people, which is more sparse and abstract, but is nonetheless still necessary. Timeless Reason – Global warming is slow but inexorable. The obvious result is more icebergs crashing into the sea, increasing sea levels and the intensification of weather extremes: hurricanes in Florida and catastrophic fires in California. The daily weather is the noise, from which the small but very relentless signals of the global warming climate can be extracted. The main natural drivers of global warming are solar effects and volcanism. The main human-caused driver is increased CO2 emissions. Complicated statistical techniques are used to measure the degree of global warming, to separate the long-term climate from the short-term weather. This NASA graph shows that increased global warming exists and contends it is extremely likely due to human effects. It measures about a 2.0 o C temperature increase from 1880 to 2017. The predicted effects on natural and human systems of an additional .5 o C global temperature increase upon the ecosystem are shown on this graph, on a lower temperature scale that measures mean surface temperature. 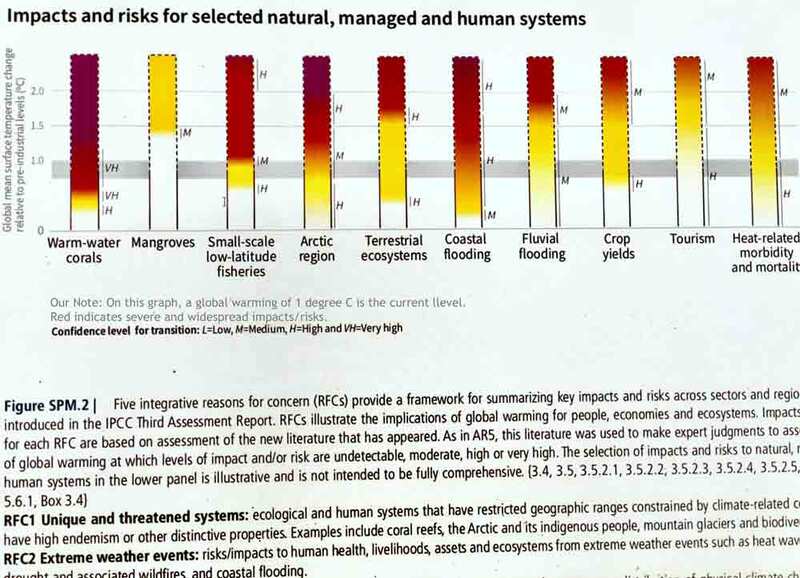 This IPCC graph shows that we are already 2/3 the way there to extremely bad events, that include coastal flooding. Public works projects to deal with anticipated coastal flooding must be planned decades in advance. Should public policy follow from these analyses? We think so. A famous astrophysicist notes that public policy should be made from the scientific consensus, not from the outliers. If you still have doubts about the human impact on global warming, it would be prudent to make at least a directional Pascal-type wager, to reduce CO2 emissions and to develop and implement renewable energy technology. This is especially so because the ecosystem may contain large non-linear effects such as the melting of the arctic tundra, releasing entrapped CO2.To vehemently deny global warming due to ideology, given this scientific consensus, is to be an ostrich. Proportionality – Why is immigration the third rail of American politics? According to the CIA World Factbook, in 2017 the net migration (both inflows and outflows) into the United States was only .39% (sic) of the total population. By this measure, the net migration into this country was only the 30th highest in the world. In comparison, Singapore (at 1.38% was among the highest) and Hungary (at .13% was among the lower.) According to the Pew Research Center, in 2016 the number of unauthorized immigrants in the U.S. was 3.3%; about two-thirds of these had been in the U.S. more than ten years. 7 Since the net migration into the U.S. is so low and since the economy needs the contributions of immigrants, what gets in the way of the common-sense solution of normalizing the status of all those who are here already and then adopting a rational immigration policy? Accepting that nationalism and patriotism are the warp to the Enlightenment’s woof, in the 21st century what is the difference between a positive civic nationalism and an inflamed ethnic one? Civic nationalism takes pride in one’s country and its values – what it stands for. It is positive and inclusive in tone. An inflamed ethnic nationalism is negative, can be politically exploited, and has its obsessions - in this case immigrants (real or imagined), threatening the borders of an insecure nation-state. The most likely real cause of today’s inflamed nationalism in the developed world is the “creative destruction” of the often impersonal capitalist system, exacerbated since the Great Recession of 2008, offering opportunities to some and misfortune to others. Increasing inequalities and hardships caused by the operation of the economic systems make a reasonable resolution of the immigration issue very difficult. The following will address their causes. “The bourgeoisie (i.e. capitalist) cannot exist without constantly revolutionising the instruments of production…Conservation of the old modes of production in unaltered form, was, on the contrary, the first condition of existence for all the earlier industrial classes. Constant revolutionising of production, uninterrupted disturbance of all social conditions, everlasting uncertainty and agitation distinguish the bourgeois epoch from all earlier ones…. In the competitive process, all economists will agree, profits are eventually squeezed out in a commoditizing economic system. According to Marx, the worker (proletariat) will also be progressively impoverished as management further substitutes capital for labor. In the contemporary world, capitalism is not much different, but see footnote 6. Many companies, to maximize profit in the name of “shareholder value,” will export jobs abroad to minimize costs and lay off workers at home. 11 A CEO that does not do these things will likely not grow short-term earnings, the company’s stock price will decline and he will lose his job. This system disadvantages Americans as long-term producers, but not as short-term consumers. To cite just one example; the 11/30/18 Financial Times notes that the Apple iPhone would cost twice as much if it were manufactured in the United States. Some economists make a Panglossian assumption that people who are displaced can always do something new. What is ignored in this most general of formulations is the fact that as the economy continues to innovate (and progress), it requires different skills which, in many cases, involve a high degree of education or training - that those who are made redundant do not possess. Consider the broader issue of automation and artificial intelligence. Wages used to be high in the manufacturing sector because the productivity of manufacturing was high. At the assembly line level, a single worker’s marginal product was high because he was involved in the production of lots of widgets; his company could therefore afford to pay high wages. But consider the effects of automation upon the abilities of the economy to provide a livelihood for workers and goods for their consumption. The low level of real U.S. industrial productivity growth correlates with the fact that U.S. industry is only the seventh most automated in the world/10,000 employees in manufacturing (after Korea, Singapore, Germany, Japan, Sweden and Denmark). 14 This will affect the promise of an automated industrial economy to provide a cornucopia of goods in the future (without further increasing the trade deficit), a supply side problem. About services and the evolution of the Internet. Benedict Evans is a venture capitalist at Andreessen Horowitz. In a notable 11/18 talk (if you want to go directly to what we’ll describe, its at 19:15 into the discussion), he summarized Internet developments. He notes that ¾ of the world’s adults are already connected on the Internet. The access stage of the Internet is coming to an end, and its use stage is just beginning. Internet services began with “blind services,” such as AOL, then it allowed decentralized innovation where anyone (including us) could put up a website. Then innovation became centralized by services such as Google, which captured meaning and intent (and therefore value) in a highly abstracted manner. For instance, Google does not know what a chair is, with its multiple meanings. Decentralized artificial intelligence, machine learning, produces multiple levels of meaning and provides for the ability to scale people in many ways. We think the result of this is to enhance the powers of highly trained people who understand both the capabilities of the system and the needs of their customers. AI can develop as a facilitating tool, for as the current head of AI at Facebook, Yann Lecun in the 12/18 issue of Wired notes, “…making artificial intelligence more humanlike helps AI to navigate our world. But directly replicating human styles of thought? It’s not clear that’d be useful. We already have humans who can think like humans; maybe the value of smart machines is that they are quite alien from us. ‘They will tend to be more useful if they have capabilities we don’t have…Then they’ll become an amplifier for intelligence….You want them to be more rational than humans.’ In other words, maybe it’s worth keeping artificial intelligence a little bit artificial,” 16 and for people to contribute situational awareness. Timeliness – Because it is the basis for happiness and achievement, healthcare is more like a right than a consumer good. But its development in the United States is at the convergence of many different (and well-funded vociferous) interests. It took courage to originate, enact and implement the Affordable Care Act of 2010, whose benefits many people are only now beginning to appreciate. Values, as Isaiah Berlin writes, conflict; and compromise is necessary before people go to extremes. But behind these social values lie the personal cardinal virtues of prudence, temperance, fairness and courage. Without these, society would fall apart. The United States is starting to lose social control because of economic stress on the middle class and because these personal virtues, although still present, are not sufficiently discussed and valued. The bottom line for the above analyses is that there is an increasing appropriate role for good government (representing society) to help solve long-term systems problems that the short-term markets will simply ignore, until it is too late. To begin to solve common problems, it is first necessary to recognize that they exist.